HOPE STREET RESTAURANT offers a spacious 68-seater dining experience in our newly renovated and expanded BYO restaurant. Offering fresh, high quality Northern Irish ingredients creating a varied menu with the focus firmly on great seasonal produce. 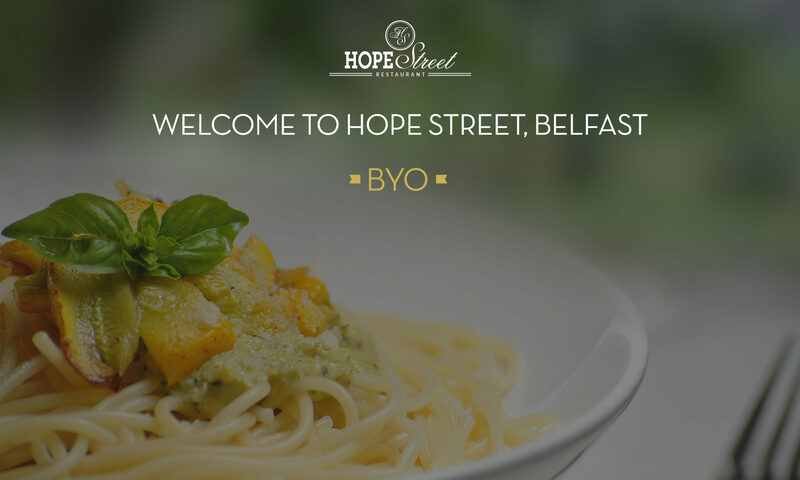 HOPE STREET RESTAURANT is the perfect place to catch up with friends, family, or celebrate those special occasions. Our Pre-Theatre Menu runs all night Tuesday – Thursday and until 6.30 Friday and Saturday. We currently do not have a licence to sell alcohol so encourage you to Bring Your Own . Unfortunately, we do not do deals on corkages for large parties as without a licence this is our main drinks revenue stream during evenings. We treat everyone fairly on this.